Wow, what a great blog. The author says she’s low carb and her first two postings are fried chicken and Chocolate and Cinnamon Babka. Her fourth is titled “Lasagna”. I get it. But, this one is different, I promise. I’ve avoid carbs for the better part of a decade because I have a tendency to be insulin resistant. I don’t want to be diabetic. Low fat diets don’t work for me at all. My husband was diagnosed with diabetes and made a drastic switch to a low carb diet. He also has a gluten intolerance, which sort of reinforces the low carb thing. The one meal he really, really missed was lasagna. I created this recipe for him. Before I begin, I want you to understand this is a crazy fussy recipe. I am not exaggerating. Lasagna is all about moisture management. To recreate the water absorbing characteristics of the now missing pasta, one will have to remove as much moisture as possible from all the other ingredients. If you can do it, you will have an amazing lasagna that is gluten free and no one, and I mean no one, will miss the noodles. The other warning is that lasagne is not an exact measurement type recipe. Depending on how heavy you make certain layers, you may need more or less of some ingredients. In other words, you may have too much sauce, but not enough cheese or vice versa. The vegetable lasagnas I had in the past were watery messes. No way you could make one that would cut like the square you see above. Not a chance. Plus, they tasted like the vegetables that were in it. I guess that’s the point, but lasagna should taste like, well lasagna. Now, if you wanted to make this a vegetarian lasagna, all you would have to do leave out the Italian sausage. 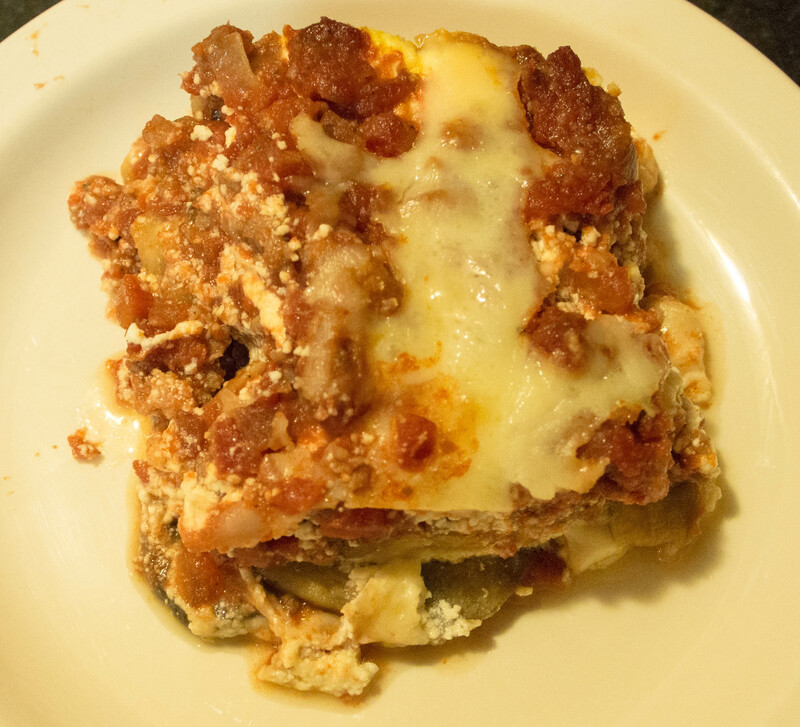 Culinary experts in Britain said they discovered the origins of lasagna while researching medieval dishes in preparation for the Joust festival at Berkeley Castle in Gloucestershire. They said a recipe for the dish was found in The Forme of Cury, a book cooked up by a group of chefs on behalf of King Richard II around 1390. Actually, few people without a stake in crawling out of the basement ranking of world cuisine could blame the Italians. Think lasagna and the dish that comes to mind, at its heart, is pasta, tomato-based sauce and cheese. But in 1390, tomatoes in English cooking were still 200 years off. The recipe in The Forme of Cury refers to a dish called “loseyns,” which, not surprisingly, did not list tomatoes among the ingredients. Sounds like a non-tomato lasagna to me! Of course, this might just be the first written recipe for such a dish. The origins of the name “lasagna” could also be Greek from the word “laganon” meaning “flat sheet of pasta” or from the Latin word “lasanum” meaning “cooking pot”. The first part of moisture management begins with what is the pasta substitute: the eggplant. 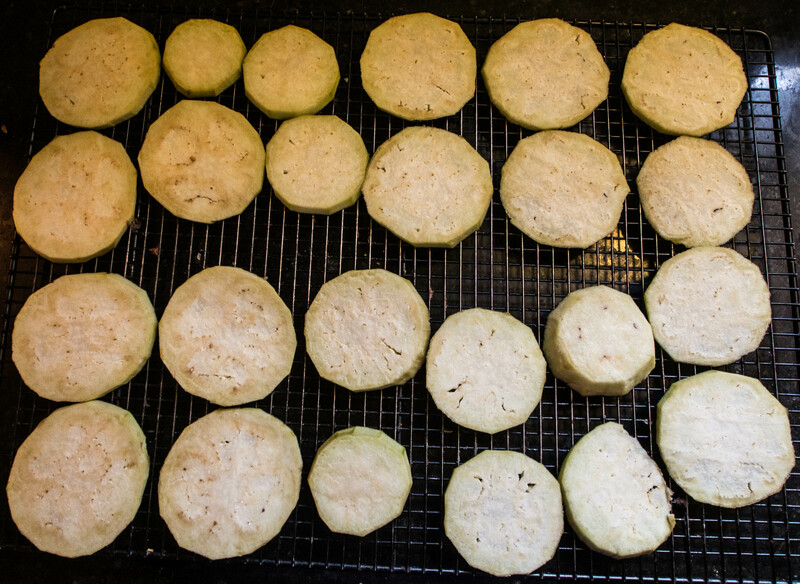 First, cut the eggplant into thin rounds. Not too thin, as they have to stand up to drying in the oven. Around a 1/4 inch thick. Place the rounds on a rack and sprinkle each round with salt. Let sit for 30 minutes. Flip and repeat. While your eggplant is sitting, place a cheesecloth, coffee filter or paper towel in a sieve and sit over a bowl. Put the ricotta in the sieve and let drain in the refrigerator for an hour or until needed. Put the olive oil in a large, 8 quart sauce pan over medium heat. When the oil is just hot, add onions and saute until translucent. Add garlic and the optional mushrooms along with the salt and pepper. Adding the mushrooms will add moisture, so you really want to cook this mixture down as far as possible, about 20 minutes. You must keep an eye on it at this point to avoid burning or excessive browning. Add oregano and bay leaves and continue to saute. The mushrooms should be greatly reduced in volume before the next step. Deglaze the pan with your choice of liquid. I had an open bottle of port, so I used that. You want to boil this off or down, again as much as possible. Just prior to running out of liquid, add the canned tomatoes. Let simmer over medium low heat for about 2 hours. You want a fairly “dry” sauce. 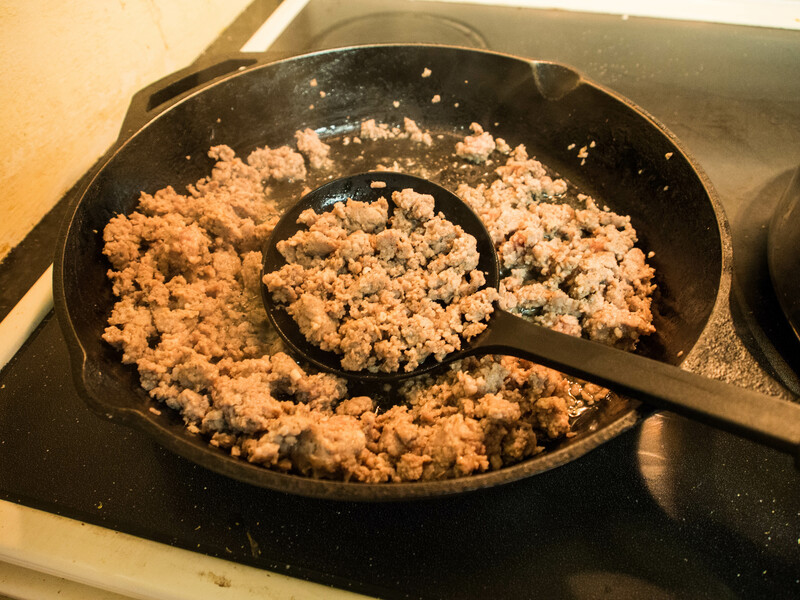 While the sauce is simmering, brown the sausage in a separate pan. When the sausage is cooked through, drain and add to the tomato sauce. 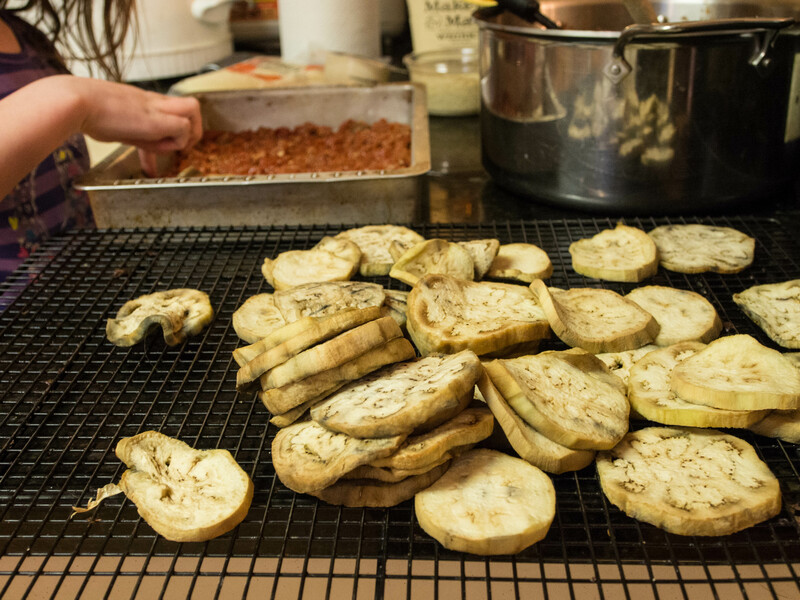 While the sauce is simmering and after the eggplant is finished its salt rest, lightly rinse the salt off the eggplant and pat the rounds dry. Ready two baking sheets with a silicone sheet like Silpat. Place the rounds on the baking sheets. I know Silpat is interchangeable with parchment paper, but I didn’t use parchment paper here, so I don’t know whether is would work for the next step. Preheat the oven to 300 degrees and bake for 20 minutes until well wilted. Check periodically to ensure no burning and if you are using both sheets at the same time in the oven, make sure to rotate the pans for even cooking. Flip the rounds over and bake again for the same amount of time. They should come out looking rather dry and haggard. 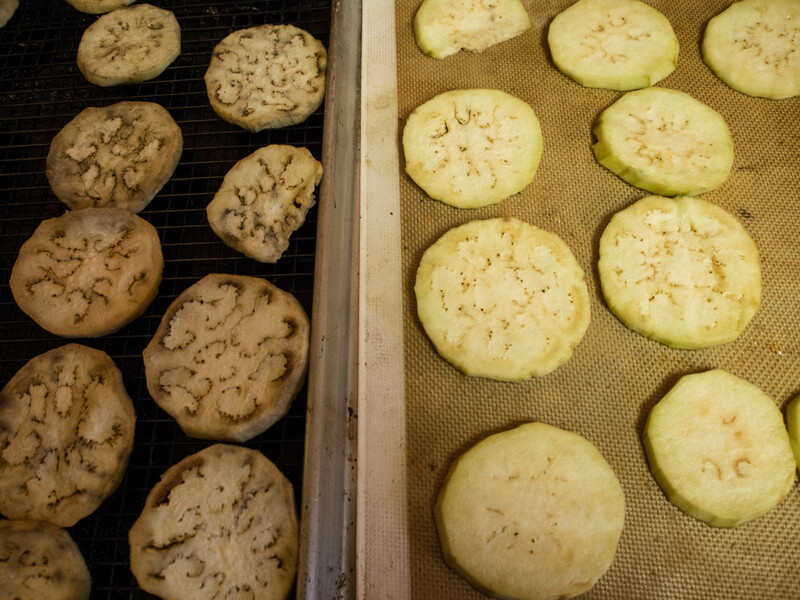 Remove the eggplant rounds from the baking sheets and place on cooling racks. 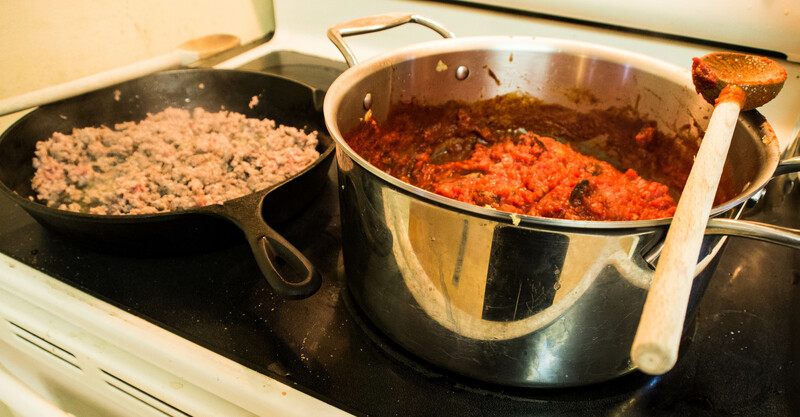 While the eggplant rounds are cooling, remove the ricotta from the sieve and place in a separate, clean and dry bowl. Stir in egg yolk and set aside. Ladle a layer of sauce on the bottom of a 9 x 13 pan, or a lasagne pan if you have one. On top of that layer, place the eggplant rounds, then the ricotta mixture, parmesan cheese and the shredded mozzarella cheese (the whole milk mozzarella is for the top only). Repeat the layers until you reach the top of the pan. The last two layers should be sauce, parmesan cheese and the whole milk mozzarella cheese. This is a square cut that retains its shape with easily discernable layers. 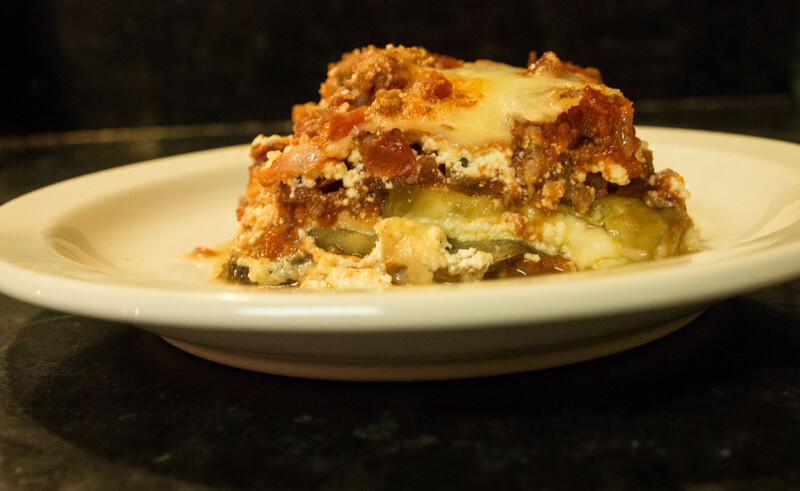 The eggplant has returned to plump and the whole dish presents as “lasagna” not “vegetable lasagna”. Fussy, yes, but not hard and worth it. Especially, if you have been missing lasagne on your low carb diet. This entry was posted in Main Dishes and tagged eggplant, Gluten Free, Italian, Lasagna, Lasagne, Low Carb, mozzarella, ricotta, tomato on March 20, 2013 by dawn of food.